These easy No Cheese Mini Quiches with a hash brown potato crust are gluten-free, casein-free (using ghee) and perfect for breakfast during the week, brunch, or taking on a picnic. They are tasty little treats! Press out the moisture from the hash browns in a paper towel. Mix together the unsalted butter (or ghee) and hash browns in a bowl. 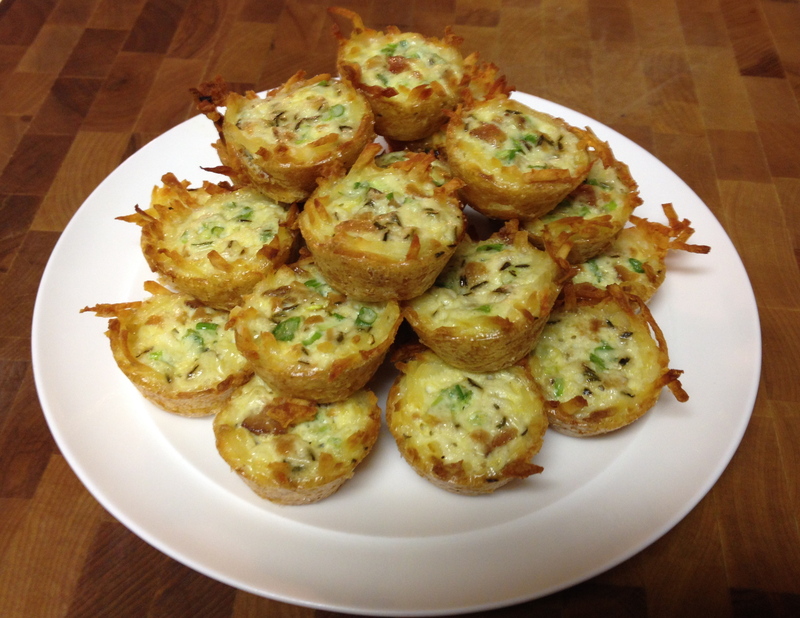 Scoop the unsalted butter-coated hash browns into the wells of a 24 mini muffin tin. Press into each well with the back of a melon baller or small ice cream scoop. Cook for 20 minutes so that the hash browns begin to brown. Meanwhile, mix together the eggs and coconut milk. Add the thyme, salt and pepper. When the hash brown crusts are ready, remove from the oven and decrease the temperature to 400 degrees F. Fill each crust with a pinch of bacon and onions. Spoon or ladle the egg mixture into each well so that they are filled to the top. Place in the oven and cook for another 15 -17 minutes and the quiches have set. Remove from the oven and let cool on a cooling rack before removing from the pan. Sprinkle with more salt to taste. Enjoy! I use ghee (clarified butter) and coconut milk because I’ve started to develop a sensitivity to casein. If you are not avoiding casein, then regular unsalted butter works just fine.